Stone Energy Corporation is having an incredible day in the market today, following up on gains that we saw yesterday. Early on, the stock climbed in a big way, and while we did start to see a mid-day correction, the stock is now back to heading upward. Below, we’ll talk about why the stock is headed up, what we’re seeing in the market, and what I’m expecting to see from SGY ahead. The truth is that today isn’t the only day that Stone Energy has been running. In fact, it has had a strong time in the market over the past few trading sessions. Another important thing to keep in mind here is that this isn’t the only stock in the sector that’s gaining either. At the end of the day, the entire oil and energy sector has been on a strong run as of late, and for good reason. For some time now, the world has been looking for ways to solve the oil supply glut problem. 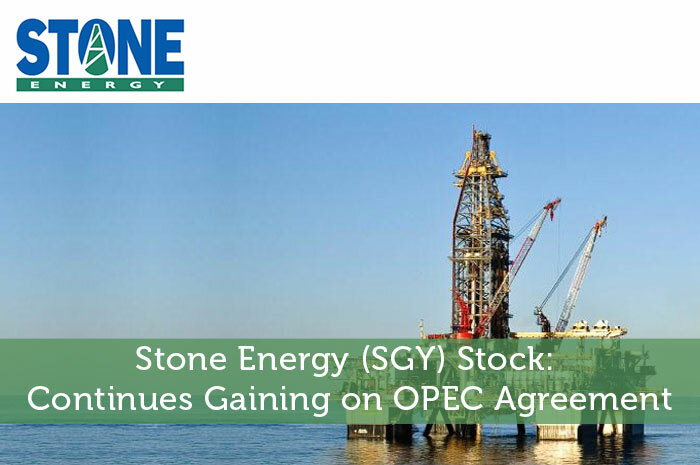 A few months back, SGY and many others in the sector saw big gains as OPEC announced that it has reached an agreement to reduce the production of oil among members. The only problem was that the agreement hadn’t been finalized. In fact, the agreement hadn’t even been completed. No one knew which OPEC members would agree to produce what amounts of oil. With so many questions surrounding the deal, there were many that proved to be skeptics. Nonetheless, OPEC said that it would finalize the agreement by November 30th. This led to investors walking on egg shells, wondering if big players like Iran and Iraq would actually agree to production cuts. Nonetheless, on November 30th, OPEC finalized the agreement and production was cut by around 1 million barrels of oil per day. As the law of supply and demand dictates, this has sent the value of oil upward. Because SGY derives its value from oil, this is also incredible news for the stock. As investors, we know that the news moves the market. When positive news is released with regard to a publicly traded company, we can expect to see gains in the value of the stock associated with the news as a result. Adversely, negative news will generally lead to big declines. In this particular case, the news is overwhelmingly positive. There are plans in place to help to reduce the massive supply glut facing the industry and Stone energy will likely benefit in a big way. As a result, the stock is climbing in the market today. At the moment (1:42), SGY is trading at $6.90 per share after a gain of $0.61 per share or 9.70% thus far today. Moving forward, I’m going to be keeping a close eye on this growth. While it is understandable at the moment, it can quickly get out of hand, leading to a bubble that will eventually burst. I’ll also be keeping a close eye on key statistics surrounding the oil sector. Supply and demand data news will generally lead to movement. So, keep your eyes glued to this data to ensure that you’re ready to take advantage of the opportunities it creates. Where do you think SGY is headed moving forward? Join the discussion in the comments below!